Remember when some pundits thought we were all going to dump our laptops and switch to tablets and iPads? So – not so much. 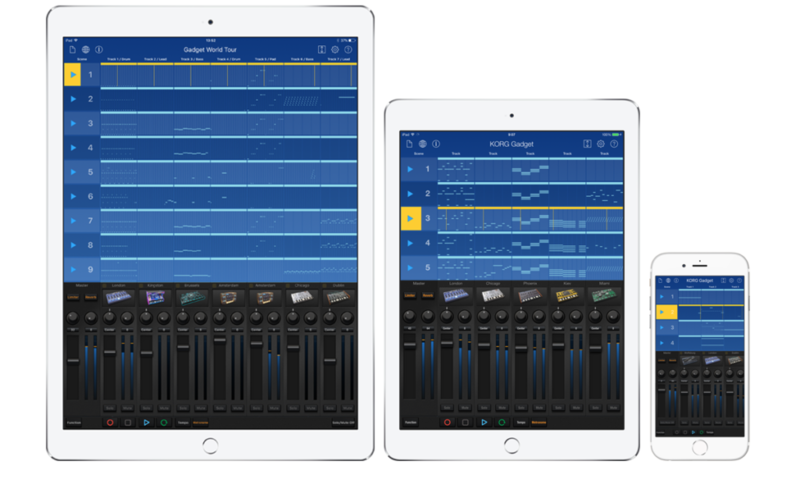 But mobile platforms are having a big impact on music software – and KORG Gadget, now making the leap from iOS to Mac, may be most emblematic of that. Who is KORG Gadget for? Well, sort of for everyone. Beginning users can find it a nice way to play around – and might well try this before desktop software. More advanced users are likely to find it an appealing set of tools, but would want to use it to extend other hardware and software – on the go, or integrated with those tools when they’re at home or in the studio ready to work. If you haven’t tried it and you’ve got an iPad (or iPhone, even), Gadget is great – fun to play, lots of tools, and lots of great sounds. KORG also have nailed the smart approach of adding modules in a way that’s fun, so that adding additional instruments feels a bit like getting a new cartridge for your Game Boy or adding a stomp box to your pedalboard. Gadget started on these Apple things. Social. Allihoopa is just emerging as a way of sharing music with other producers, but KORG are embracing it. (The sharing site began its life with Propellerhead before being spun off. So naturally Reason, Figure, and Take all have integration – and KORG Gadget, too.) That seems essential, given the signal-to-noise problems sharing music online. Synced. Ableton Link support, also quickly becoming a must, means you can sync with Ableton Live, Reason, Maschine, and other apps on desktop, plus loads of apps on iOS – so, easy local sync on your computer between software tools, easy sync between computers, easy sync with mobile, whether you’re playing alone or jamming with other people. Wireless. There’s Bluetooth MIDI support, too. For new users, this means the possibility of using hardware without thinking about wires and MIDI adapters. It makes sense on your computer screen. Full-screen apps are a bit silly on the more generous screen real estate on your desktop, so KORG have opted for a four-app split-screen approach that makes loads of sense. Complete plug-in support, when you want it. AU (for Logic and GarageBand), AAX (for Pro Tools), and VST (for everything else) are all supported. There’s even NKS support, which lets you integrate with Native Instruments hardware and software easily. (For instance, you’ll get physical controls on NI’s Maschine hardware and keyboards.) The upshot of this: all those clever independent instruments and effects from the iPad are now just as modular on the desktop, dropped into whatever your software of choice is. On the go and back again. The whole point of this, of course, is the ability to complete workflows between desktop and mobile seamlessly. And that’s where a lot of conventional software from Native Instruments, Ableton, Propellerhead, and others are a little uneven (partly because they began their life on desktop). Here, you have essentially the same tools in both places. Gadget on the Mac also brings some new devices – a 16-pad drum machine, and two new audio recording tools. But there are two paths here – the beginner and the more advanced user. Beginners may find this a way to start to take steps from mobile to desktop tools (and hardware). Advanced users may come from the opposite direction – trying Gadget with or without an iPad, and integrating on-the-go or casual use with sitting down seriously at a computer and finishing a track. This gets us out of a cul-de-sac in music making software that we’ve been stuck in for a few years. Desktop software has always tended to be more complex and larger, with fairly monolithic tools that try to appeal to everyone, but then tend to turn off newcomers. Mobile software may seem like a way out of that, except that the low price points users demand on the app stores make it hard to justify development costs. Innovation on both tends to be stymied by those same problems. So, imagine instead that you combine the benefits of both. KORG Gadget is then just one small step. And it’s also limited to Apple platforms – just as Windows gets a bunch of interesting hardware. But it could be a nice sign of things to come. We’ll be watching closely to see how KORG prices Gadget on the Mac versus mobile, what the experience is like on desktop (since we’re judging only by iOS), and who embraces it. But it’s very nice to see an option like this that looks friendly to beginners, without forcing advanced users to give up their way of working. We’ll be eager to test it. Also, lest it seem like I’m waxing poetic about Gadget for no reason — I’m very much indebted to other people who have spent loads of time working out how to get the most out of it and making great music. Our friend Jakob Haq has done some nineteen videos so far for Gadget alone, and it’s chock full of tips and musical inspiration.